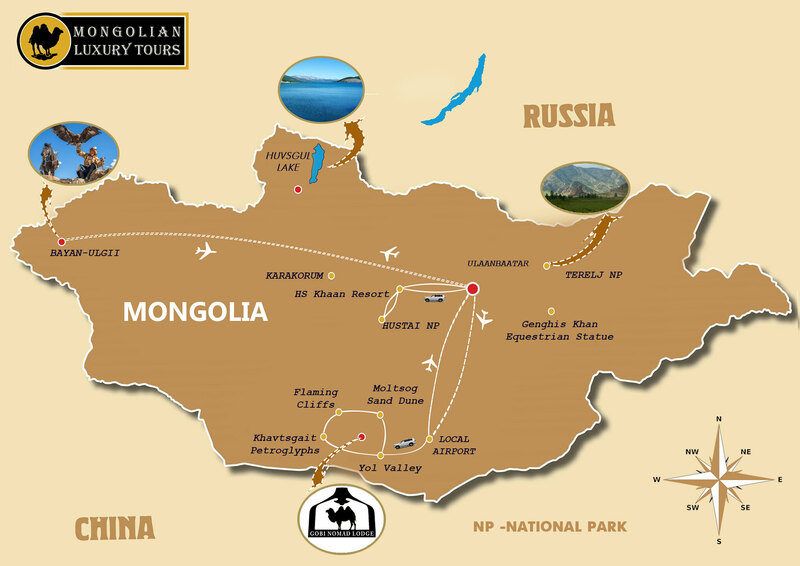 This tour offers you to discover two enchanting regions of Mongolia: the Altai Mountains of Western Mongolia, where Kazakh ethnic group people celebrate their centuries old traditional culture of hunting with golden eagles, the Gobi Desert, the vast and dramatic desert in the world and visiting Hustai national park, home for re-introduced Przhevalsky horse or wild horse, ancestors of domesticated horses. This luxury journey starts from the Gobi, exploring diverse landscapes of alpine gorge of Yol valley, towering Singing sand dunes and the famed Flaming Cliffs, the legendary paleontological site opened by Dr. Roy Andrews Chapman who discovered in early 1920s the first nest of dinosaur eggs the world ever seen. The tour further lies to Bayan-Ulgii province at the annually held Golden Eagle Festival. Nomadic Kazakh tribes trained and used Golden Eagles for hunting purposes for thousands of years; and the Golden Eagle festival is aimed at preserving that ancient tradition and custom as well as protecting this endangered species. In early October of each year, the Kazakh hunters attend the festival with their golden eagles, where during at the several competitions they demonstrate speed, agility and accuracy and other skills of the hunters and their eagles. National folklore performances and a parade are organized at the square of the provincial central town in honor of the hunters and their eagles. The festival is also a good chance for the locals to meet up, share news and experience of training eagles before upcoming long harsh winter. Golden eagle festival is definitely a highlight of any visit to Mongolia and unforgettable unique authentic experience. Our tour ends with enjoying seeing Przevalkyi horse or wild horses successfully re-introduced at the park since 1996. Once died out in 1960s in their natural habitat, western part of the Gobi desert, the wild horses became extinct and with the assistance and support from Dutch government those beautiful horses were brought from the European zoos; and nowadays, Hustai national park has over 300 wild horses grazing on the slopes of mountains and hills of the park. In early morning or late evening we can spot those endemic for Mongolia wild horses up close. You also will learn about them in the information center of the park as well as community based activities implemented by Hustai national park.